Dark energy, a proposed force or energy that permeates all space and accelerates the Universe's expansion, may vary over time. A new study combining X-rays from Chandra and XMM-Newton and ultraviolet and optical data from SDSS provides distances to quasars. These quasars are observed back to times about a billion years after the Big Bang. The new result showed that dark energy's effect on the expansion rate in the early Universe may have been different from today. A new study using data from NASA's Chandra X-ray Observatory and ESA's XMM-Newton suggests that dark energy may have varied over cosmic time, as reported in our latest press release. 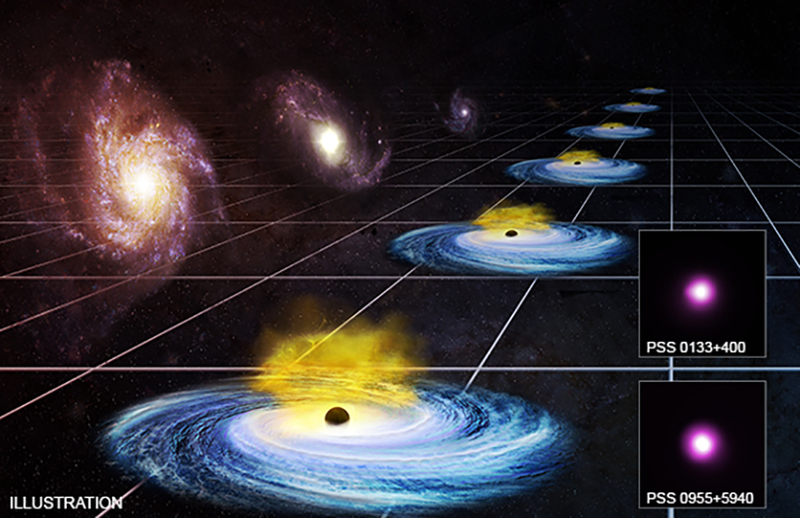 This artist's illustration helps explain how astronomers tracked the effects of dark energy to about one billion years after the Big Bang by determining the distances to quasars, rapidly growing black holes that shine extremely brightly. First discovered about 20 years ago by measuring the distances to exploded stars called supernovas, dark energy is a proposed type of force, or energy, that permeates all space and causes the expansion of the Universe to accelerate. Using this method, scientists tracked the effects of dark energy out to about 9 billion years ago. The latest result stems from the development of a new method to determine distances to about 1,598 quasars, which allows the researchers to measure dark energy's effects from the early Universe through to the present day. 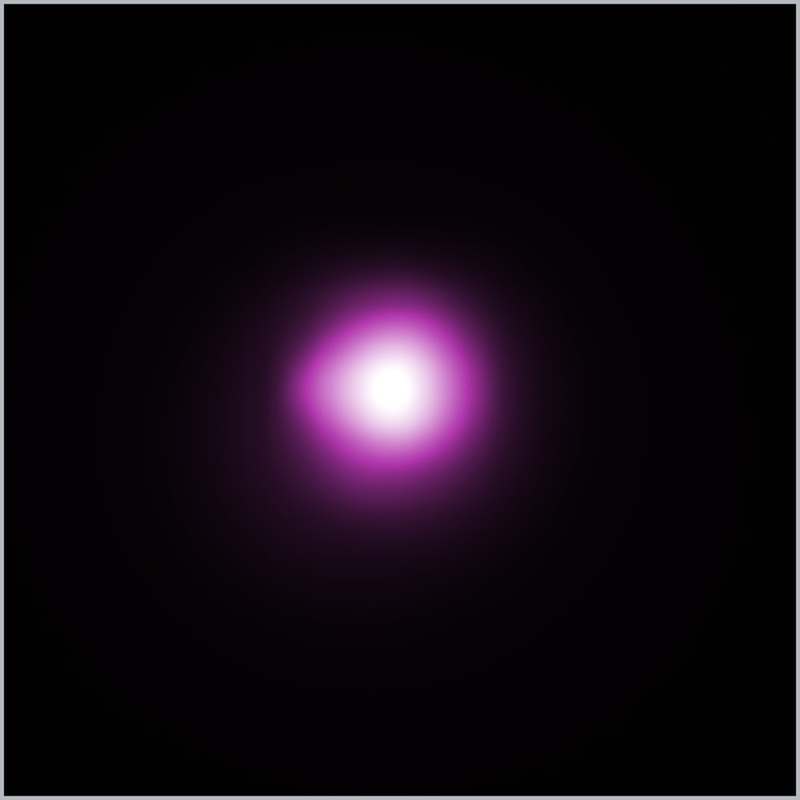 Two of the most distant quasars studied are shown in Chandra images in the insets. The new technique uses ultraviolet (UV) and X-ray data to estimate the quasar distances. In quasars, a disk of matter around the supermassive black hole in the center of a galaxy produces UV light (shown in the illustration in blue). Some of the UV photons collide with electrons in a cloud of hot gas (shown in yellow) above and below the disk, and these collisions can boost the energy of the UV light up to X-ray energies. This interaction causes a correlation between the amounts of observed UV and X-ray radiation. This correlation depends on the luminosity of the quasar, which is the amount of radiation it produces. Using this technique the quasars become standard candles, as implied by the artist's illustration, showing quasars with the same luminosity at different distances from Earth. Once the luminosity is known, the distance to the quasars can be calculated. This is because the observed amount of radiation from quasars converted into standard candles depend on their distance from Earth in a predictable way. The researchers compiled UV data for 1,598 quasars to derive a relationship between UV and X-ray fluxes, and the distances to the quasars. They then used this information to study the expansion rate of the universe back to very early times, and found evidence that the amount of dark energy is growing with time. Since this is a new technique, the astronomers took extra steps to show that this method gives reliable results. They showed that results from their technique match up with those from supernova measurements over the last 9 billion years, giving them confidence that their results are reliable at even earlier times. The researchers also took great care in how their quasars were selected, to minimize statistical errors and to avoid systematic errors that might depend on the distance from Earth to the object. Coordinates (J2000) RA 01h 31m 04.8s | Dec 03° 45´ 37.8"
Coordinates (J2000) RA 09h 51m 37.4s | Dec Dec 59° 54´ 43.6"
A study of about 1,600 quasars — rapidly growing black holes. The quasars in the survey are located up to 12.7 billion light years from Earth. An artist's illustration with images of two different quasars from Chandra. A Quick Look at Where is the Universe Hiding its Missing Mass?